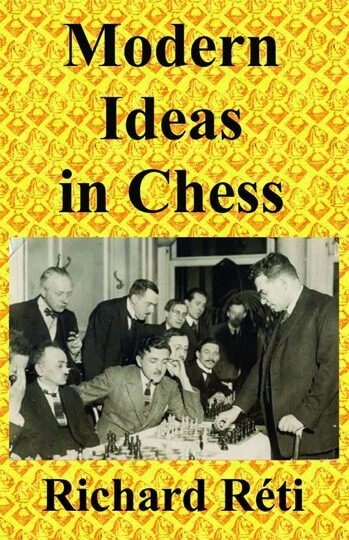 Modern Ideas in Chess is one of the Great Classics of chess literature. Originally published in German in 1923 as Die neuen Ideen im Schachspiel, it created an immediate sensation. This was a period of the emergence of new theories and new ways of thinking about chess. The great opening systems that are standard today were just in the process of being invented and had not yet been named. Openings such as the King's Indian Defense, the Queen's Indian Defense, the Nimzo-Indian Defense and the Gruenfeld Indian Defense were called "Irregular Openings" or had not yet been played. Richard Reti was the leader of what was known as the "Hyper-Modern School of Chess". Their main idea was not to try to dominate the center as the classical way of playing required. Rather, allow the opponent to take the center and then chip away and undermine his center from the flanks until it collapses and falls. This was the strategy that Bobby Fischer later used in many of his games which propelled him to the World Chess Championship. Best of all, Richard Reti was an entertaining writer. This book is a good read even for those who are not interested in applying these theories to tournament chess.